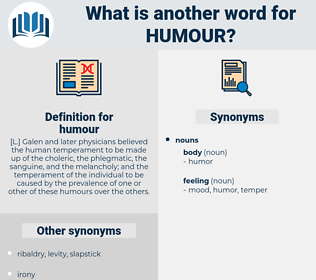 What is another word for humour? [ L.] Galen and later physicians believed the human temperament to be made up of the choleric, the phlegmatic, the sanguine, and the melancholy; and the temperament of the individual to be caused by the prevalence of one or other of these humours over the others.
" I can't," he added, with a burst of humour, " to tell the truth, I'm afraid." On account of their humour and their common everyday tone, the English household and folk tales will make a strong appeal. 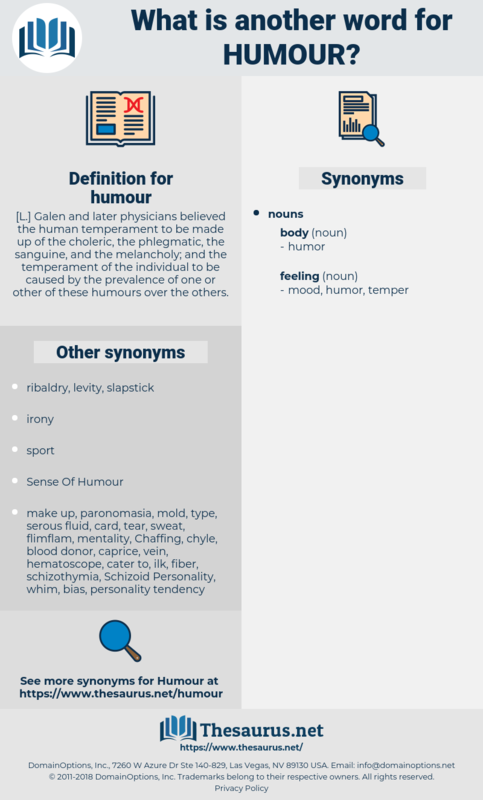 Good Humour, sulk, Ill Humour, ill humor, good temper, good humor, amiability, distemper, sulkiness, peeve.